The global market for membrane separation systems is gaining from measures taken for water conservation and from adoption of technology for wastewater treatment for the essential commodity to last for successive generations. Municipal agencies and metropolitan planners in several countries are preparing for the impact in the event of water shortage which is an essential commodity. This is pushing the need for innovations in water treatment technologies, which in turn, is stoking demand for membrane separation systems. Proving to be a roadblock to the growth of this market are high establishment and operational costs, insufficient lack in emerging economies, and availability of alternate technologies for water treatment. 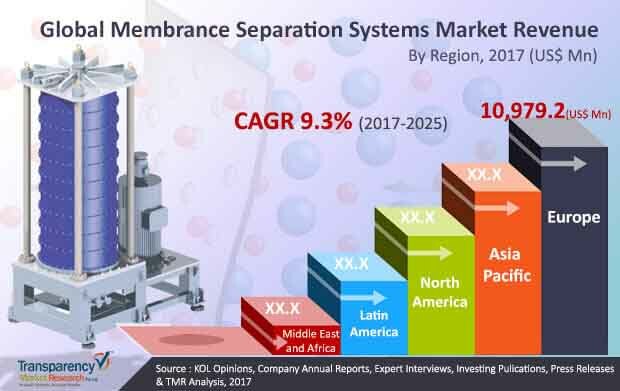 As per a report by Transparency Market Research (TMR), the global membrane separation systems market is expected to rise at a CAGR of 9.3% between 2017 and 2025, for the market to touch a revenue valuation of US$61,801.9 mn by the end of 2025 from a value of US$28,134.4 mn in 2016. The membrane separation systems market is studied on the basis of technology, application, material, and geography in this report. On the basis of technology, the global membrane separation systems market has been segmented into microfiltration, ultrafiltration, nanofiltration, reverse osmosis, chromatography, and ion exchange. Of them, microfiltration segment led the global membrane separation systems market in 2016 owing to their widespread use in the biopharmaceutical industry. Going forward, microfiltration segment is expected to display sluggish growth as the technology has been excessively used in developed countries such as the U.S. and Canada and newer filtration technologies for membrane separation systems have been introduced. However, ultrafiltration segment is expected to rise at the leading CAGR during the forecast period as the technology is increasingly being adopted in food and beverages and in the vaccine production industry. The ultrafiltration segment accounts as the second leading revenue generator in the overall market. Reverse osmosis is expected to emerge as a significant segment in the global membrane separation systems market on account of its increasing demand in water and wastewater treatment and for the desalination of seawater. Based on application, the global membrane separation systems market is segmented into environmental, food and beverages, healthcare, and others. Among them, the environmental segment leads the market in terms of revenue. This is mainly because of extensive demand for membrane separation systems from water and waste water treatment industry, rising global population, scarcity of pure water, and rising interest for conservation of essential commodities such as water in developing economies of Asia Pacific. Urban population in East Asia which was reported to be 1.3 billion in 2016 is expanding at a rapid pace. Urban populace that account for almost three times more water and energy consumption than the rural populace is necessitating the adoption of technologies for water reuse to prevent water scarcity situations. Food and beverages is also expected to emerge as a key application segment as membrane separation technology is accepted by several regulatory bodies for its high reliability. The key segments of the market, based on material include polyethersulfone, polysulfone, cellulose-based, polypropylene, nylon, polyvinyllidene fluoride, polyacrilonitrile, polytetrafluoroethylene, and polyvinyl chloride. The polyethersulfone segment holds the leading share in the overall market. The growth of the segment is driven by its extensive use in healthcare industry for production of monoclonal antibodies and vaccines, and due to its high reliability for protein separation processes. Geography-wise, North America, Europe, Asia Pacific, Latin America, and the Middle East and Africa are the regions into which the market is divided in this report. Of them, Europe held the commanding share in the membrane separation systems market in 2016. Prominent companies operating in the global membrane separation systems market include The Dow Chemical Company, Koch Membrane Systems, Pall Corporations, Sartorius AG, 3M, Amazon Filters, Advantec MFS Inc., GE Healthcare, Merck Millipore, Novasep, and TriSep Corporation. This report on the membrane separation systems market analyzes the current and future scenario of the global market. Rise in population in the water-stressed area, lack of availability of pure water, growing demand for membrane separation systems in the food & beverages industries for protein separation process, clarification of fruit juices and alcoholic beverages and in biopharmaceuticals industries sterile vaccine productions are the major drivers of the global membrane separation systems market during the forecast period. The global membrane separation systems market report comprises a detailed elaborate executive summary, which includes market snapshot that provides information about various segments. It also provides information and data analysis of the country’s market with respect to the segments based on technology, application, and material. An elaborated qualitative analysis of drivers and restraints, opportunities, and trends has been provided in the market overview section. Additionally, the section comprises pricing analysis to help understand the competitive landscape in the market. This section also provides market attractiveness analysis in terms of country, thus presenting a thorough analysis of the overall competitive scenario in the global membrane separation systems market. Based on technology, the market has been segmented into microfiltration, ultrafiltration, nanofiltration, reverse osmosis, chromatography, and ion exchange. The market segments have been analyzed based on efficiency, cost-effectiveness, and preference for various water treatment, food & beverages, and healthcare industries. The market size and forecast for each of these segments have been provided for the period from 2015 to 2025, along with their respective CAGR for the forecast period from 2017 to 2025, considering 2016 as the base year. Based on application, the market has been segmented into environmental, food & beverages, healthcare, and others. The market segments have been extensively analyzed based on rise in demand from water and wastewater treatment plants, dairy, and biopharmaceutical industries. The market size and forecast in terms of US$ Mn for each segment have been provided for the period from 2015 to 2025. The report also provides the compound annual growth rate (CAGR %) for each market segment for the forecast period from 2017 to 2025, considering 2016 as the base year. On the basis of material, the market has been segmented into polyethersulfone (PES), polysulfone (PS), cellulose based, nylon, polypropylene (PP), polyvinylidene fluoride (PVDF), polytetrafluoroethylene (PTFE), polyacrilonitrile (PAN), and polyvinyl Chloride (PVC). This segmentation has been done on the basis of usage of particular membrane in various industrial processes like desalination of sea water and separation of proteins. Geographically, the global membrane separation systems market has been segmented into North America, Europe, Asia Pacific, Latin America, and Middle East & Africa. The market size and forecast for each of these regions have been provided for the period from 2015 to 2025, along with their respective CAGRs for the forecast period from 2017 to 2025, considering 2016 as the base year. The report also profiles major players in the global membrane separation systems market based on various attributes such as company overview, financial overview, product portfolio, business strategies, SWOT analysis, and recent developments. Major players profiled in this report are Koch Membrane Systems Inc., Pall Corporation, Sartorius AG, 3M, Amazon filters, Advantec MFS, Inc., GE Healthcare, Merck Millipore, Novasep, TriSep Corporation (Microdyn-Nadir US, Inc.).